A cozy outdoor set that offers space for relaxing with your favorite drink on your porch or patio during the day, and the easiest way to have a quick meal with someone special in the evening - our Poly Dining Tete-A-Tete makes a great addition to any outdoor space. Starting with two cozy Adirondack dining-style chairs, and combining them with a functional tete-a-tete table with space for an umbrella, the end result will transform any outdoor area into a comfy retreat where you can enjoy every gorgeous day. 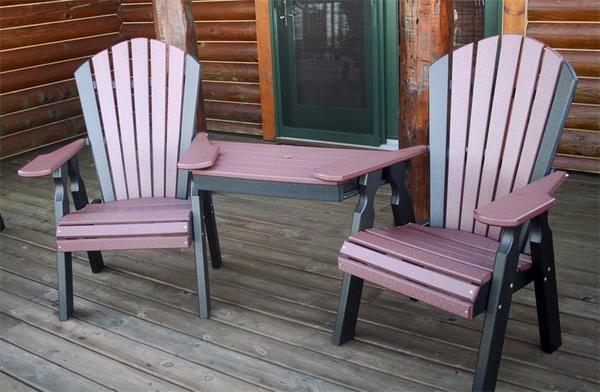 The center table also offers an easily removable mount that will allow you to transport this set as needed, or separate each chair whenever you have the need. Combine with our beautiful 42" Round Poly Coffee Table for a one-of-a-kind set that will offer plenty of additional space to kick your fit up and keep your favorite food and beverages ready for your outdoor excursion. Choose from a variety of colors for your new poly tete-a-tete set to complement any outdoor decor and your new set will be handcrafted just for your - ready for decades of carefree outdoor relaxation. Table Width Front - 24"
Table Width Back - 38"